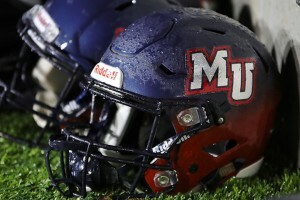 Malone University announced today that it will discontinue football as an intercollegiate sport as part of a restructuring process designed to eliminate a $2.5 million structural deficit over the next two years. Malone football players and coaches were informed of this decision in a meeting with Malone President David King and Director of Intercollegiate Athletics Charlie Grimes. The decision will eliminate expenses of approximately $1 million annually. Malone will continue to honor the athletic scholarships of current football players and walk-on (non-scholarship) football players will continue to receive merit and need-based financial aid. Staff members from Financial Aid, Student Life, and the Center for Student Success are being made available to football team members to assist them through this transition. The decision to eliminate the football program was finalized by the Board of Trustees on Wednesday, January 30 and announced less than 48 hours later. University officials moved quickly in order to provide the information to prospective scholarship students prior to the National Signing Day scheduled for Wednesday, February 6. Malone remains committed to athletic competition in the NCAA Div. II and as members of the Great Midwest Athletic Conference (G-MAC).